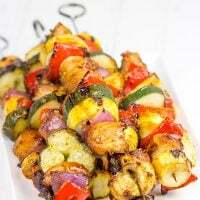 Spicy Honey BBQ Chicken Skewers - Fire up the grill this weekend! Spicy Honey BBQ Glazed Chicken SkewersBrushed with a quick and easy glaze, these Spicy Honey BBQ Chicken Skewers make for one heck of a tasty dinner on the grill! Can we talk for a bit about those foods that you develop a taste for over time? I’m talking about those foods that you couldn’t stand when you were younger. You kept trying them, and you kept hating them. But then one day you realized, “Hey, these salt-and-vinegar potato chips kinda taste good.” At first, one chip was enough. And then it was two or three. And then you realize the entire bag is gone. Oops. So salt-and-vinegar chips are definitely one of those foods for me. I suspect my initial disgust with these was related to the fact that my mom used to use vinegar to clean the hardwood floors in our house when I was a kid. Whenever she cleaned the floors, you could count on not having any sinus problems for the rest of the day. Man, I still remember that smell of vinegar! My wife loves salt-and-vinegar potato chips, but I always thought they tasted like a cleaning product. Hmmm…I wonder why. But one day I ate a chip, and I thought, “hmmm…these are strange. I don’t dislike them. But they are strange.” Over the course of several months, I would nibble at salt-and-vinegar chips whenever we had a bag around. And then one day it hit me. I actually craved them! It was like I was eating chips right off the freshly cleaned floor…and I liked it. Go figure. Blue cheese and olives both fall into this same category. My wife loves both of them, but I just couldn’t bring myself to bite into a big hunk of blue cheese. And I felt like I should like olives out of principal. Italian food is by far the pinnacle of deliciousness, and Italians love olives. And dipping bread into olive oil is one of my favorite snacks of all time. So why didn’t I love olives? Little by little, I kept trying olives. I started with the milder ones and slowly progressed up. I haven’t made my way to the strongest olives yet, but I did actually eat a blue cheese-stuffed olive the other day. And I liked it. Another food that falls in this category? Barbecue sauce. Yup, that’s right. I was that weird guy who didn’t like BBQ sauce. 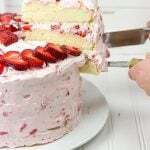 It was something about the sweetness of it. I’ve always had issues with the sweet + savory combination. I love sweets…but they are for dessert. BBQ sauce was just too sweet for me. But then I made pulled pork sandwiches, and I mixed a little BBQ sauce into the pork when I reheated it. I liked it. Then I added a little more. I liked that, too. And now I can pretty much slather the stuff on. That love for BBQ sauce is what inspired these Spicy Honey BBQ Glazed Chicken Skewers. Our garden has been in full force for several weeks now, and we’ve been picking zucchini and cucumbers like it’s our job. Those zucchini grow so fast, too! I swear one day I see a little tiny one forming…and then two days later, the thing is bigger than your left arm. 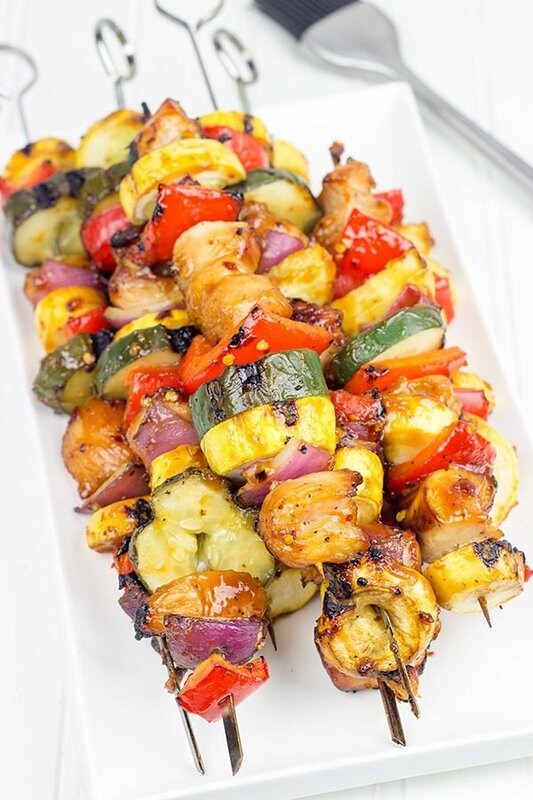 I grabbed a zucchini and threaded it onto skewers along with some yellow summer squash, red bell pepper, onion and chicken. These skewers would have probably been delicious just by themselves, but the real shining star was the Spicy Honey BBQ Glaze. I whisked this glaze together while the grill was preheating and then I brushed it over the entire skewers while they grilled. These bad boys were delicious! But my wife totally called me out during dinner. “Did you realize you are eating something that is both sweet and spicy?” Uhh, yeah, I totally realized that. I mean sure. Add sweet + spicy to the list of flavors above! Excuse me while I go eat a hunk of blue cheese. Do you have any favorite flavors/foods that you used to hate? Did you make these Spicy Honey BBQ Glazed Chicken Skewers at home? Leave a comment. Or snap a photo and tag me on Instagram (@Spicedblog). Happy Grilling! 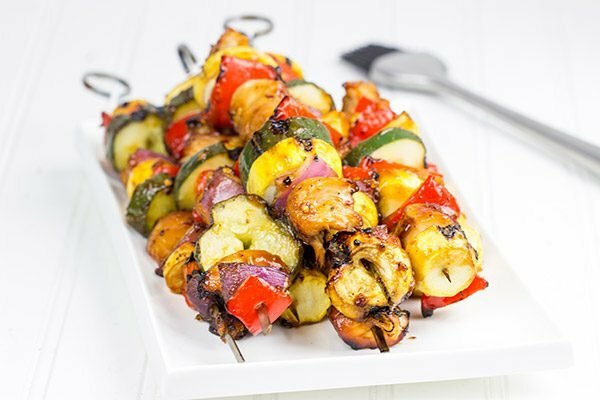 Brushed with a quick and easy glaze, these Spicy Honey BBQ Chicken Skewers make for one heck of a tasty dinner on the grill! 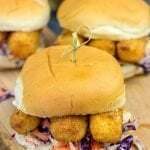 Slice the chicken breasts or tenders into 1” cubes; set aside. In a small glass baking dish, whisk together the soy sauce, olive oil, honey, garlic, salt and pepper. Place chicken in dish and toss lightly until well coated. 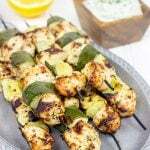 Thread chicken, zucchini, squash, onion and pepper onto the skewers. Flip skewers and brush tops with remaining Glaze. Cook for 5-6 more minutes, or until chicken is completely cooked. Mix ½ cup of the water with the corn starch until well combined. Set aside. Using a small sauce pan, combine the remaining ingredients (remaining ½ cup of water, brown sugar, honey, barbecue sauce, garlic and crushed red pepper flakes) over medium-high heat. Bring mixture to a boil. Let mixture boil for 10 minutes, stirring occasionally. Reduce heat to low and stir in the cornstarch mixture. Cook over low heat, stirring constantly, for 1-2 minutes or until the sauce thickens. Set Glaze aside. They (I am not sure who “they” are) say that your taste buds change very 7 years, so it’s always good to try things again that you thought you didn’t like. Dave HATED olives for so long, and now he is obsessed with them. The same goes for allergies too – he was allergic to peanuts for 30 years, and now he is not. So weird. Loving these skewers too. 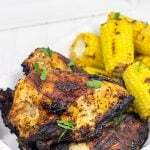 Honey on chicken is kind of the perfect combo! These are my kind of skewers! Loving everything about them! About that vinegar….love those chips and I still use vinegar to clean my wood floors! So funny how smells evoke such strong memories. I am so glad you got on the spicy+sweet train! A chap at Trader Joes recently talked me into trying an “Uncured Bacon Ganache Bar” – at first, I was skeptical – but after that first bite, I wished I hadn’t handed over the bar to Lil Shashi (being an only child she has sharing issues)! BTW – loving all the brown sugar/hone/chili flake action in that marinade/glaze! The colors are stunning! I love the spices you’ve seasoned with- garlic and red pepper flakes are some of my faves! Hi David! I love to put the whole meal on skewers! We are overrun with squash right now. I didn’t like a lot of things as a kid because my mother hated to cook and she horrible at it! That inspired me to start cooking, because I was hungry! Squash is definitely one of those veggies that gets a bad rap (kinda like Brussels). But we are actually huge fans of squash on the grill. In fact, pretty much every garden veggie works on the grill. We’ve tried ’em all…oftentimes because we are just simply overrun and don’t have another way to use them. Haha! haha there’s a lot of food that falls into that category, it is strange how will end up liking things as we grow up! 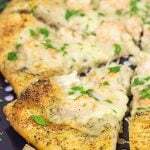 I love the touch of honey in this recipe! David, love these honey BBQ chicken-skewers!!! I need to get some on the grill before summer is over!! love how colorful these look! I used to hate coconut but now I love it! 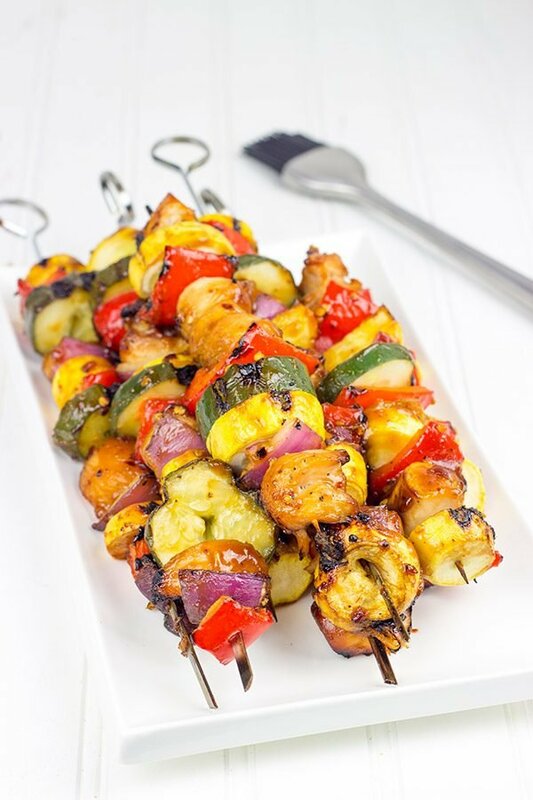 Although I no longer eat chicken, but these skewers look amazingly moist and tender and those veggies Yummers! Let’s see I used to abhor veggies and now I working my way back to being a vegan-go figure. Dude! Salt and Vinegar chips were the 1 flavour our family would fight over in the mixed bags! I also hated olives until I read a book and the protagonist loved them…Yeah, that was odd. Now as for BBQ sauce…Had you NOT liked it in today’s day and age, I would have relegated you to KK level. That condiment is golden (brown). That’s so funny! The salt and vinegar chips would sit around forever in our house…that is until Laura came along. Now I kinda enjoy those things. So strange, but still kinda tasty. Wait, you started liking olives because you read a book and the good guy liked olives? Haha…at least you’ve got a good rationale, right? 🙂 That’s true…I don’t want to end up in KK-ville. That’s reserved for boxed cake mixes and frozen blueberries. Haha! Yup, blue cheese is definitely on the list for me, too, Ben! I used to hate the stuff. (“Why would anyone knowingly eat moldy cheese?”) But now I love blue cheese! It’s totally one of my favorite dressings. Legit good. I’ll drop a couple skewers to you in the mail today. I hope they make it up there safe and sound! Herbs with dessert? Are you off your rocker, Kevin? haha…just kidding, of course! I have played around with some herbs in desserts before, and they are strangely addicting. Wait. Blue cheese dressing with balsamic? Now you’re talking! Those are both some pretty stout flavors, but I think I would like the combo. You’re a flavor master, my friend! I can understand spicy peppers, Rachelle. I mean, you have to like spicy foods. But regular bell peppers, too? Hopefully you will have a ton of zukes and squash soon! I have yet to have luck growing pumpkins, though. They get all happy and big, but the little pumpkins never seem to actually grow. 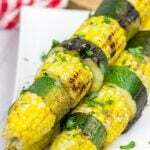 But zucchini and squash on skewers is one of our favorite summer meals! David, this honey bbq chicken looks killer delicious! 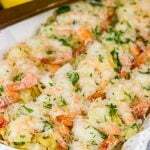 Love that you used summer squash! Pure taste and dose of veggies in one! Loving it! I can see myself definitely making these skewers. What an easy and delicious way to use up seasonal produce! Yes! 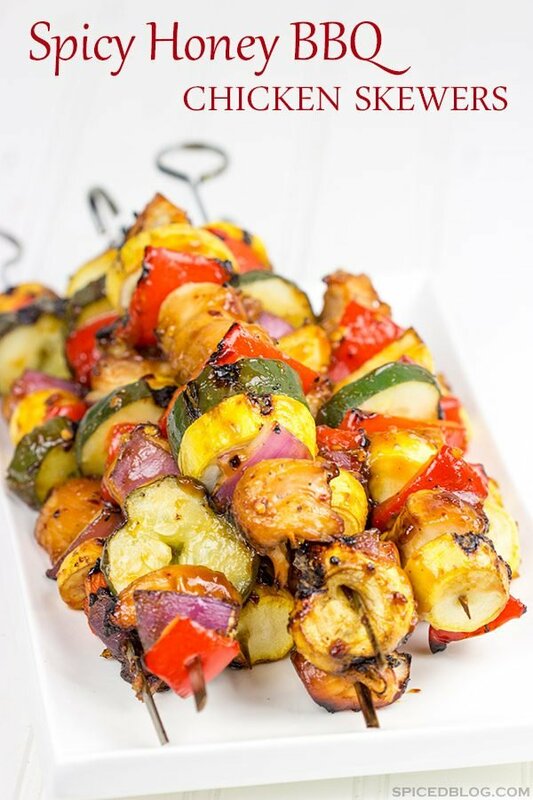 These skewers are indeed an awesome way to use up summer produce…especially when the garden zucchinis are going crazy! 🙂 Thanks, Thalia! !